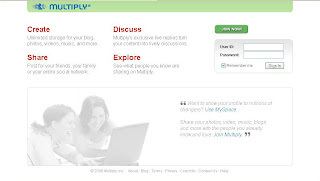 Multiply.com--amazing photo sharing site with a difference. The most friendly stuff when it comes to uploading photos is that there is a Java and Ajax upload tools available at this site when you choose to upload photos. And instead of just uploading photos one by one, using this option you can just drag and drop all your photos or even copy and paste all the photos onto the upload box. And I dig this feature. YOu can also import photos from Yahoo, Windows Live spaces, Flickr or any other web pages. You can choose these options to upload photos by clicking on the related link at the bottom of the page where you upload photos by where it is written "Check out our JAVA, AJAX and E-Mail upload tools. One can even upload photos via email. You also get an yourname@multiply.com url and can customize your webpage. Another feature is that apart from uploading your own vidoes you can add videos from YouTube and Google videos and can upload your music to this site and share it with your friends. Apart all these there is a free blogspace available and many other features. Check it out folks.